Everyone has old faded or damaged family photos that are irreplaceable. Using Adobe Photoshop CS6, I am usually able to improve even the worst photograph. I can’t work miracles, but you might be surprised at just what I can accomplish! Estimates are free. Original photographs are scanned at a high resolution. This is something you can do yourself if you have a good scanner, or photos can be mailed to me for scanning. Either way, the original photograph is not altered in any way and will be returned to you. 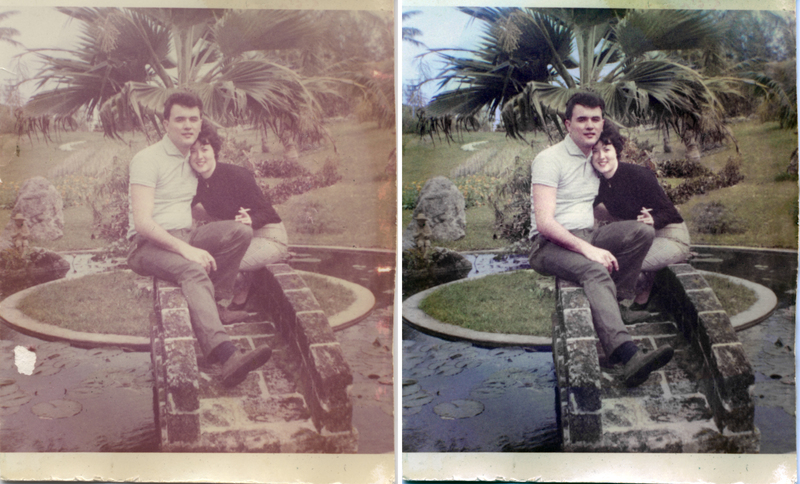 Again, all restoration work is done to the digital scanned image, not to the original photograph! I can provide you with a corrected digital file or high quality print. Depending on your preference and instructions, photos are color corrected as much as possible. Fading and oxidation is reversed, and proper contrast restored. Scratches, tears, folds, and other surface damage can usually be repaired, noting this process is not magic. Anything missing must be digitally reinterpreted and added. Results vary depending on the degree of original damage. The following are some examples of work I have done over the past 10 years. This is a family photo of my mother and her sisters (c. ~1932) that I restored for her 10 years ago. 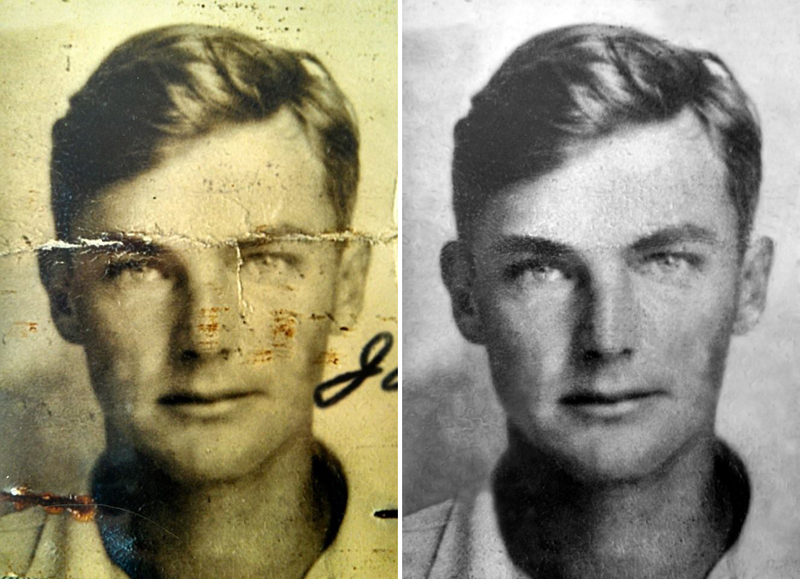 The original photo shown on the left was scanned at a high resolution. You can see evidence of the silver oxidation and fading, especially around the edges. Restoration was accomplished through digital manipulation using Adobe Photoshop . 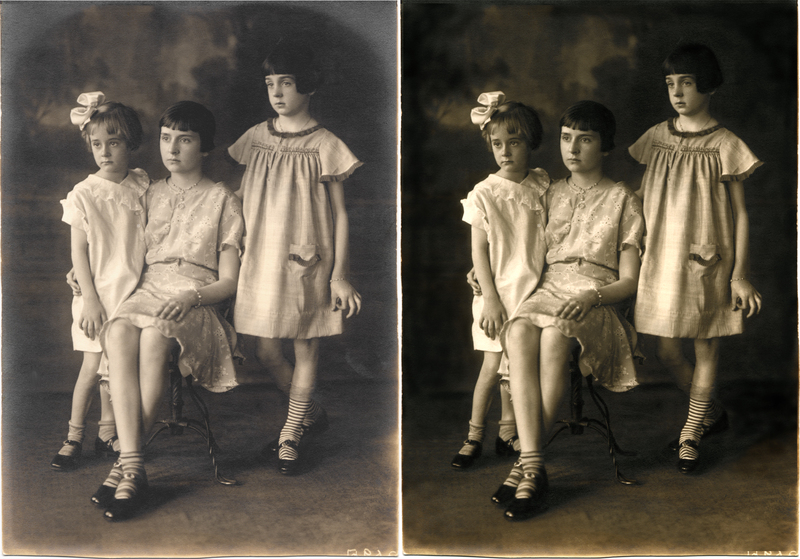 The restored image, shown on the right, was then printed on special 100% cotton paper using archival inks. This c. 1940s vintage photo was heavily damaged and discolored, having been probably folded or creased at some point. The photo was restored to black and white, with the surface damage corrected. The partial signature was removed at the client’s request. This was a tiny (2×3 inch) snapshot that was heavily faded with a surface tear. Color and contrast were restored and the surface tear digitally filled. The restored photo was re-printed in a larger size, approximately 3×5 inches. This belonged to a former co-worker who wanted his nieces removed from his son’s photo. I was able to remove the girls and fill in the space to match the background. The original photo of this lovely young lady featured an unfortunately placed bucket. I removed the bucket, painted in the piling, removed the red date stamp, and corrected the contrast and saturation.